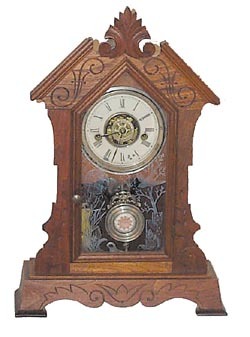 Waterbury Clock Co. parlor clock, "Salem", ca 1881, or if not it is a sister Runs one day, strikes and alarms, both on a nickel bell. Pendulum is nickel, as is the bell, dial rings, and a glass that matches. The glass shown in the book is on a sister clock, the "Portland". Great glass. 19 inch walnut case is near perfect. 100% original. Ly-Waterbury No.1575.